This trip can be taken by either car or bicycle for cycling enthusiasts. Take the road for Cartagena from Puerto de Mazarron, as you approach the filling station turn right towards Isla Plana. Keep going until you reach the turning for La Azohía - the road is a very pleasant costal drive and passes some nice bays and beaches. Pass the turning for La Azohía and the road gently inclines. stay on this road until you see a turning on the right to Campillo de Adentro, take this road. Campillo de Adentro lies in the hollow of a pretty valley surrounded by mountains. There are a few houses and farms but little else. Pass through the village and eventually you will come to the start of a military road with warning signs forbidding passage. Ignore these, they haven't been removed since the military abandoned the zone a few years ago. For the next 7 km the narrow road twists it's way upwards through the mountains, giving breathtaking views of the coastline and countryside. This is where driver caution is particularly important as this has become quite a popular place in recent years, the road is very narrow and it is tight for cars to pass safely. Near the summit there is a left turn which takes you to the Guns, if you continue straight on then you'll get to a TV mast which has the same fine views as from the Guns, but nothing else. The Guns are approximately another 2 km from this turning. This is a place which is certain to interest military historians, or simply those who fancy seeing something a little different. 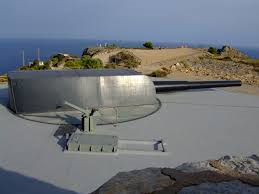 The main attractions are the two massive guns at Castillitos with their associated sighting points and control rooms. 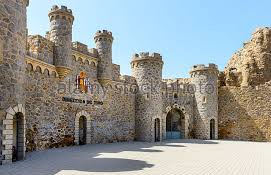 Although military architecture is often ugly, here the Battery has been built into the mountainside in the style of a castle using local stone. 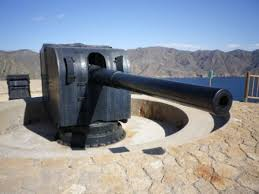 There are some smaller guns further along the road at Jorel which are also quite large but seem small in comparison to the guns at Castillitos. Finaly there is an abandoned AA battery at Atalayon which is the peak you first encounter on reaching the batteries. These massive batteries were part of the shore defenses for Cartagena, which is the headquarters of the Spanish Mediterranean Fleet, and often has visiting warships from other countries, including the USA. It isn't known if these guns were ever fired in anger, although presumably some rounds must have been fired for commissioning purposes or for training exercises. This outing would take about half a day to complete, you could visit one of the bars or resturants on the La Azohia road you passed earlier for refreshments on your return journey.